The "Wire Binding Machine, 2:1 Pitch, Manual, Wire-O,Movable Pins" is a combo with manual puncher and manual closer. It punches upto 20 sheets (20lbs paper) and binds upto 140pages. This 2:1 Wire binding machine comes with 27pcs removable punching dies with disengagement pins for clean punch. It is easy to operate and powerful enough to meet all your needs for wire binding. 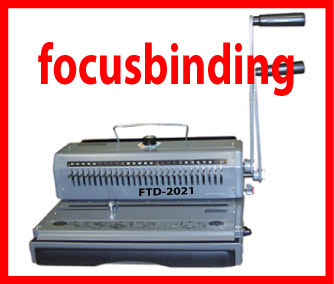 This 2:1 Wire binding machine is an ideal tools for binding reports, booklets, school assignments, documents, etc. with double wire-O binding.